Local Creative Communications Student and beer lover Clayton Winter has produced a really good 10 minute documentary about the growing craft beer scene in Manitoba. I had the good fortune of being interviewed for it. This project was for his independent profession project Creative Communications. A year-long project in between semesters three and four in the program. I stopped in to visit with Little Brown Jug this past week and catch up on their progress. I have to say that the space is looking both fantastic as well as pretty much complete. They have been working hard on getting their beer ready and they are ready to go. 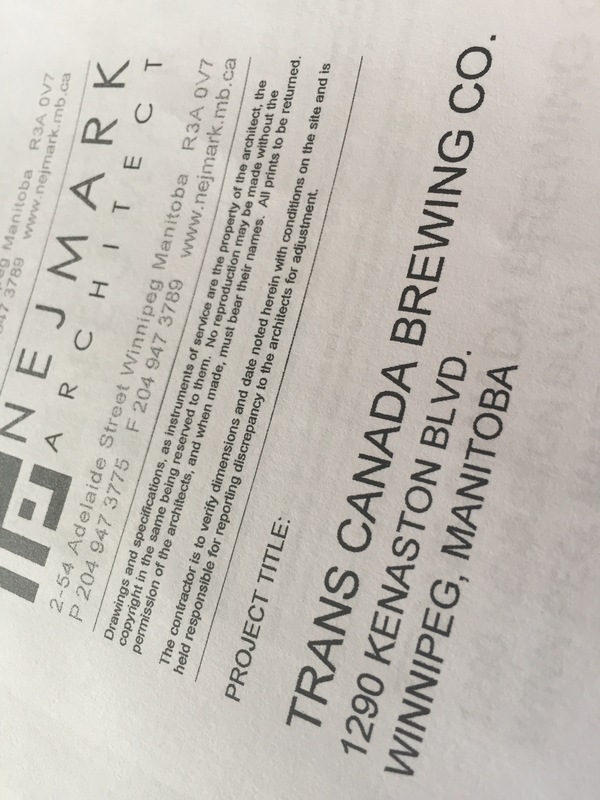 It’s an exciting time for beer in the city of Winnipeg. Last week was spent really dialing in on the brew house system. It’s actually a pretty incredible setup that focuses on efficiency (both in brewing and environmentally) and recovers much of the heat from the brewing process. The kettle actually uses steam through an external calandria which allows for an incredibly quick rolling boil and a much more efficient process. They have also installed an auger from their grain room directly into the mash tun. In fact, they are able to grind into a sealed auger so that they can prepare the day before and be ready to brew. Overall the brew system is really cool and I encourage anyone interested in these things to go check it out. All of this hard work has resulted in them being ready to send out kegs this week. Kevin indicated that they would be sending out kegs to beer spots in the city – Quality Craft Beer Store, King’s Head, Good Will, Barley Brothers – Polo; Carbone – 260 St. Mary; and Pineridge Hollow. All of these places will have beer on tap this week with Pineridge Hollow coming next week. They are open as of today: Wed-Fri 3-9PM and Saturday noon – 8 PM, with these limited hours to allow for people to come in and pick up the beers. As well as the opportunity to try the beer in their tap room, they are doing growler and howler fills as well as offering pre-filled 750ml little brown jugs. The really cool thing they are doing with these little brown jugs is offering an exchange program on them. Essentially you don’t own the jug. You put a deposit down and when you come back you can either exchange it for another pre-filled one or get your deposit back, your choice. I think this is an excellent idea and it’s actually how I feel the growler system in the city should be working. Little Brown Jug is really trying to be efficient with peoples’ time and recognize that people may not always have the opportunity to wait around for a growler to be filled. By offering these jugs, pre-filled, people can pop in, grab some beer, and head on their way. While they do have a small tap-room space at LBJ, they are first and foremost a production brewery. Little Brown Jug is launching with one beer, a Belgian Pale Ale that is brewed with brewers’ gold (a derivative of a local hop). I for one am excited to get a chance to try another new beer to the market and I really look forward to seeing what they may come up with next down the road. So, follow Little Brown Jug on twitter (@LBJBrewing) and while you’re at it, follow me too (@beerwinnipeg). Tomorrow is the first day of the craft beer advent Calendar. I’ll be posting in the morning to give you an idea of what to expect but I won’t be posting about the beers until later in the afternoon/evening. Last year I inadvertently spoiled the surprise for others and I want to do my best to avoid this. So, get ready for a 24 daily posts about “New World Beers from Old World Breweries”. Sometimes I feel pretty lucky doing what I do. I had the opportunity to try out the Best of Beau’s pack a little bit early so that I could spend some time tasting and writing about the pack. This pack is already listed on the MB Liquormarts website and I’m hoping that this write-up of the four beers contained within will prove helpful to you. Overall the pack presents some diversity of styles with some interesting twists. This “Best of Beau’s” pack contains four beers. Dark Helmut – Imperious Schwarzbier, Bush-Fire – Rooibos Honeybush Beer, Collabrrrewnaut – Espresso Pilsner, and Quads & Rockers – Belgian Quad. Dark Helmut is a beer brewed in the style of a Schwarzbier, a German dark lager that literally translates to “Dark Beer”. The “imperious” nature of it both plays on the Dark Helmut (reminiscent of both Darth Vader and Lord Helmet) as well as the fact that the ABV on this beer comes in at 7.3%. Schwarzbiers are typically a balanced beer. Presenting both a smooth roasted malt characteristic along with a moderate hoppy bitterness. Lighter in body and lacking the deeper roasted malt and heavy aftertaste make Schwarzbiers easy to drink. While the history on this style is fairly sketchy, it is a regional specialty of Thuringia, Saxony and Franconia in Germany. Popularity for this beer came back after German unification and it served as an inspiration for Japanese brewed black lagers. Appearance – Pours charcoal with a thin quick fading off-white head. Taste – Bitter roasted malt notes along with sweet malt and caramel. Lingering bitter slightly astringent after taste. Mouth Feel – Soft carbonation with a dry bitter finish. Overall Thoughts – A very nice well-balanced beer that has a bit more flavour from the extra malt used to make this imperious(imperial). Do I like it? – I found this beer to be quite tasty. It wasn’t too rich or filling but still carried a nice malt and hop balance. Easy to drink and flavourful. Bush-fire is brewed using a blonde ale as a base with the addition of rooibos and honeybush teas. Blonde ales are traditional malt oriented with interesting hop or floral flavours and aromas. Light bodied, easy to drink and refreshing, these beers typically don’t overwhelm the senses with flavour. They are typically well-balanced and clean on the finish. Typically, this style of beer is brewed as an alternative to a lager, which requires a period of lagering making it a more time consuming beer to produce. This particular blonde ale from Beau’s certainly contains a punch of both aroma and flavour that is clean on the finish and very satisfying to drink. Appearance – Pours amber with a short lived thin white head. Mouth Feel – Medium carbonation, light mouthfeel with a lingering dry finish. Overall Thoughts – Overall quite a good beer. Teas bring a very good balance and depth to the blonde ale base. Honey sweetness and dry finish make for an enjoyable drink. Do I like it? – While I tend to find blonde ales not to be up my alley, this one had nice flavours to it that added quite a bit to the easy drinking blonde ale base. So, yes, I did like it. Collabrrrewnaut is a really interesting blend of a Bohemian-style pilsner base and cold brewed organic fair trade coffee. Done as a collaboration between Beau’s and Ottawa’s Bridgehead Roastery, this beer brings some really interesting flavours to an already delicious style of beer. Using Pilzen’s soft water, local saaz hops and this Bavarian style of lagering produced a clear, crisp and refreshing beer that became the standard for the style. With the introduction of modern refrigeration there was no need to use caves for beer storage and this enabled the brewing of bottom-fermenting beers in many new places. Appearance – Pours a straw colour with an effervescent white head. Smell – Smells of slight herb and spice and a subtle espresso note. Taste – Deceptive. While it has a very subtle bitterness and a clean dry finish it contains interesting depth of notes from coffee to subtle fig and hints of chocolate. Mouth Feel – Medium body, medium carbonation with a lingering dry finish. Overall Thoughts – While I tend to characterize pilsners as having a bit of a “bite” to them on the finish, this beer finishes clean. The really interesting flavours brought in by the use of coffee provide a variety of flavours that don’t typically crop up in pilsners. Do I like it? – This beer was deceptively good. The initial pour is light in colour and gets the mind ready for a lighter crisp clean beer. While this beer certainly had a clean dry finish, the flavour profile was really interesting. I rather enjoyed drinking this beer and trying to pick out the different components. The coffee used definitely added. Quads and Rockers is a Belgian strong ale that has been brewed with a focus on tradition and style. Full-bodied and full-flavour, these beers are often quite heavy, bring rich malty sweetness. The name Quadruple comes from the brewing process of this beer. Essentially it means you are adding four times the malt as you would in a Belgian “simple”. This increases the sugar content in the beer and results in a highly alcoholic beer. The best Belgian quads hide this strong alcoholic flavor making them delicious but dangerous. Quads are highly adored due to their deep color, soft maltiness and unique yeast flavors. Even with their high ABV (usually 8-12%) they are highly approachable when done right. Appearance – Pours Dark brown with a thin beige head. Smell – Smells of banana, mocha and raisins. Taste – Rich malty sweetness that has notes of cocoa, banana, and some peppery notes. Mouth Feel – Nice medium carbonation with a full mouthfeel and a lingering warmth on finish. Overall Thoughts – Overall a nice Belgian quad carrying good esters from the yeast and a full sweetness that lingers warm. Alcohol is well masked. Do I like it? – I’m a big fan of big bold beers. This was a full and enjoyable Belgian Quad that brought some really tasty flavours and a nice warmth from the alcohol. ABV is Well masked, but certainly still a sipping beer, I definitely enjoyed this one as well. Overall I was quite impressed with the beers in the “Best of Beau’s” mix pack. I can see why they chose each of these beers. They provide a wide range of styles with some great flavours. For those who haven’t been following PEG Beer Co on twitter (what’s wrong with you!) the time has finally arrived. Yesterday, October 11, PEG Beer officially launched their beers and they are now ready for consumption. It has been a long time coming. I’ve followed their progress since before their first soft opening. The delays have been numerous and some have anxiously wondered about this day. I can’t speak to the cause of those delays and I think it’s best we set them aside. While many, including the PEG team, had hoped for beer much sooner, let’s focus on celebrating: we can now finally enjoy a pint of PEG beer at the bar! The beers that are now available include their Lifecoach ISA, Soundtrack IPA, Marlyn Red Rye Ale and the Countess Stout, (they have on their own blog, too) and now that I’ve had my first taste, I’ll be providing some notes in the near future. I hope that all of you will take the opportunity to get down and to give the beers a try. Winnipeg has clamored for more craft beer and we’ve done a fantastic job of supporting the breweries who have opened so far. As another begins to produce beer, they also will require our support, feedback and comments. It’s through engagement that breweries thrive, grow and learn – and that requires the local beer community to come to the table if we truly want better beer in Winnipeg. Congratulations once again to the patience, tenacity and effort of all those working at PEG Beer Co. Glad to have your beer. I chatted with Matt Tallman, President and CEO of TransCanada Brewing Company this past week. He invited me to their space at 1290 Kenaston, gave me a tour and shared details about what you should expect from TCB when they open. Matt has been working on this project fully since April 2015. It’s been a journey to get to this point and it was really interesting to hear Matt walk me through the process. Matt has always dreamed of opening his own business. When he graduated high school in ’09 he took a business program at UNC. After a couple of years of traditional classes, he spent a semester at sea through a university in Virginia. The ocean-spanning classes gave him a chance to travel and see a lot of neat stuff. He eventually transferred to University of Western Ontario’s ivy business program – the HBA. While digesting a lot of ideas there, Matt was exposed to Ontario’s rich craft beer scene. Though he took another semester at sea to get some more travelling under his belt, he returned to Canada with a purpose, having explored the beer industry in many different countries across five continents. When Matt rolled back into Winnipeg he had a vision to expand local beer offerings. (At the time only Half Pints and Fort Garry were operating, with Farmery just starting.) Matt felt, like many others, there was a need for more local brewing in the city and he wanted to create a truly world class venue in Winnipeg. After setting his mind to this he spent a time working through vision and decided to start the project in April of 2015. Matt feels that there is a lot of opportunity in the market and that people are more interested in where their food and beverage come from, who makes it and how it’s made. A lot of people are curious about the name behind the brewery. Matt said he is often asked “Why TransCanada?” Initially he went through piles of names and had lots of ideas. One day Matt just had TransCanada pop into his head and felt it was so uniquely Canadian that it fit what he wanted the brewery to embody. With its historic and modern usage and the fact that on an average day you’ll hear it mentioned in the radio or see it written on your drive, Matt felt this was a name that was timeless. The branding for TCB is Canadiana, with design elements pulled from an earlier era (1950s-60s) to give a taste of nostalgia. While referencing the period, TCB’s branding is also meant to be timeless – something that won’t expire or go out of fashion. Matt spent eight months looking for a site before settling on 1290 Kenaston. He explained it had been a very long process and he is excited to finally get started. If all goes according to plan, TCB will open in Q2 of 2017. The concept behind TCB is interesting. While they will have a taproom they are looking at doing pizzas and will have a dedicated pizza space, pizza oven and kitchen. Matt explained the plans were being discussed before recent taproom legislation came into effect. After looking at the legislation and taproom license, he decided it made more sense to do manufacturing, restaurant and retail. All components are part of one business. The idea is not to be a brewpub but a production brewery with a taproom attached. This is very casual meeting space with no assigned seating, servers, etc. It’s a place to come and hang out and chat, enjoy the beer from the brewery and have a pizza or a beer-related snack from a set menu. Between the taproom and the brewery there will be a wall featuring 20 ft. tall windows. These windows will stretch almost floor to ceiling. Matt wants people to see what’s happening live during the day or have a nice brewery backdrop in the evening. He plans on having some funky lights shining on the brewhouse and tanks to create an ambiance for the taproom. At the bar area, Matt plans to have 16 taps. He would like one of these taps to be local/craft brewery rotating guest tap. As I hinted above, the taproom will be decorated with Canadiana. As well, there will be a private function room for events and parties. It will have the same taps as the main bar area to optimize its use for any event. This room, too, will have windows letting you see down into the main taproom and there will be A/V equipment for meetings. Right now, Matt is the only employee of TCB but he does have two others helping out who will eventually join him full time. First is Thomas Schneider. This head Pizzaiaolo (pizza guy) has been in the pizza industry for a number of years. He’ll run a dedicated Pizza area within the taproom called “Timmy Toms Pizzeria” and produce a very unique hybrid pizza. It’s close to New York style but with twisted dough prepared for individual-size orders. When the team decided pizza was the way to go, they took a trip down to San Francisco to meet pizza guru Tony Gemignani. He runs the International School of Pizza where the guys took a week-long course on making, baking, serving and selling pizza. Matt is really excited about the pizza – both the variety the can bake and the special release combinations they can curate. Also on board is Jeff Wirt. His future role will be accounting and administration but he is currently assisting with everything – a true renaissance man. Thanks to a lot of hard work, they’ve just posted the job to round out their team and hire a Head Brewer, with the ambitious goal of enticing a world class brewer to come and prepare the best beer possible. 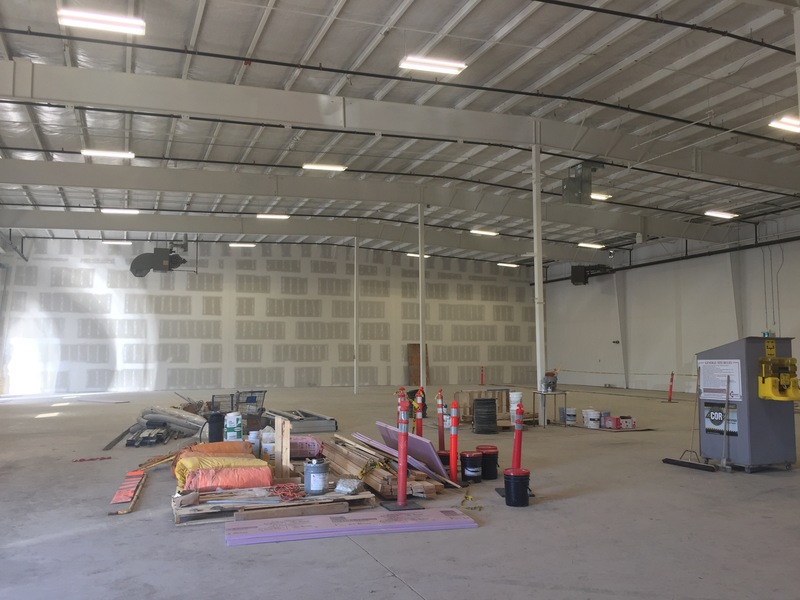 On the production side of things, there will be an overhead door separating the taproom and brewery to allow for them to hold open houses and for easy movement of kegs to the taproom. The main brewhouse is built by Specific Mechanical from Victoria, BC. It is a 35hl four vessel brew house with state of the art technology operated by touch screen controls. It has a 5 HL pilot system fully integrated into the one brewhouse. It’s fully capable of any style of beer and can do decoction mashes, kettle souring and multi-stage mashes. There are essentially two separate brewhouses, fermenters and bright tanks at TCB. For the small batch system, Matt plans to have six 10 HL fermenters and two 10 HL bright tanks while there will be six 70 HL fermenters and two 70HL HL bright tanks for the big system. This will allow for the production of small and large batches. Matt tried to automate some of the brewery to make it easier to flow and to expand in the future. To accommodate this, he is going to install a grain silo just outside with an auger through the wall that will go directly into the surge hopper and then feed to the malt cracker, grist case, and then into the mash tun. It’s a hands off approach for base malt and all of the spent grain will be augered to silo before being trucked out for feed. While specialty malt will have to be added by hand, this allows for some automation with the largest quantity malt. The brewery is designed to be scalable, adding more tanks if there is a need. The space allows them to double capacity if necessary, following a flow pattern Matt designed to be sustainable in the future. Matt really wanted the ability to produce sour beers. As part of TCB’s design a dedicated space has been set aside as “the barrel room.” This climate-controlled room, with closely monitored humidity and temperature, will house 40HL Foeders from France made from oak as well as additional barrels. 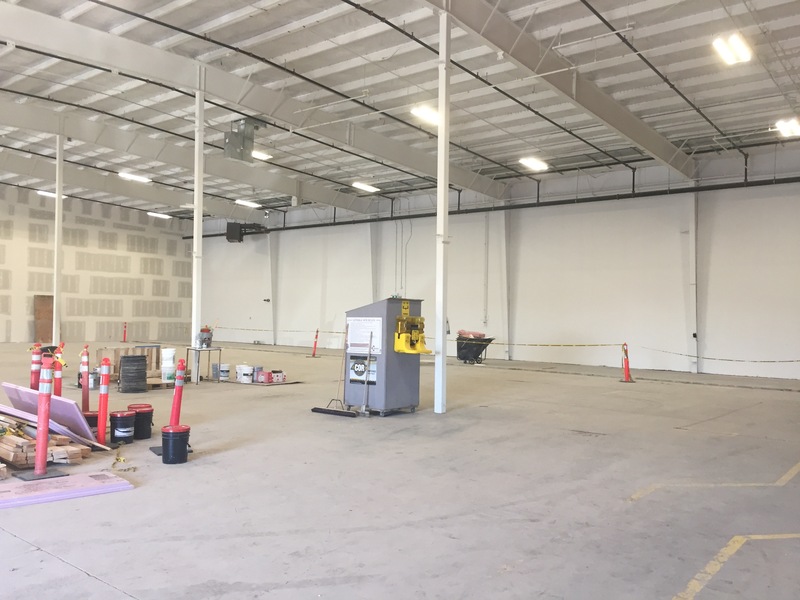 A glycol system will allow for precise temperature control within the room itself as well as overall temperature control. The room will act as an aging and conditioning room where, thanks to the Foeders, TCB will have the ability to really experiment with sour beers and barrel aged beers. It’ll be a slow start, but Matt is very excited about the potential. The main packaging line from German company Markl will allow them to bottle their main beer in open carriers of 355ml bottles and 650ml bombers. They’ll also have the ability to do cork and caging on a specialty packaging line they will use exclusively for 750ml bottles of beer from the barrel room. While Matt said they don’t plan to can, they do have the ability to add a canning line. When I was walking around the space, everything was nice and open now, but it will be quite full when all the equipment is in. You just have to use a little bit of imagination. As for the beers, Matt wants to brew many styles of beer. Obviously a lot will depend on the Brewer who joins the team, but the brewery is designed to produce a diverse array of beers including barrel aged beers, experimental beers, and mainstream styles. It’s a flexibility that matches its owner’s tastes in beer, though go-to styles for Matt to drink are American Pale ales and German Wheat ales (hefeweizen/dunkelweizen). The beer will be distributed to Liquormarts, beer vendors, as well as sold on site from their retail section. Some specialty beers and those produced in the small batch system will only be available on site. It was a great opportunity to chat with Matt. I’ve known about TransCanada for quite some time and I’ve been trying to get him to give me some details. Having the opportunity to hear about the plan is exciting. I can’t wait to see how things progress and to have the opportunity to visit along the way. Matt has a pretty swanky T-shirt he’s made, and if you’re interested, just contact him through their website and he’ll give you the details on how to get one of your own.